We love our dogs. They are a part of our family and we would do anything to help them. That is why it hits us so hard whenever they struggle with their health. One of the major populations in our practice are older dogs, and there’s a reason. Aging is hard on the joints, muscle strength, nervous system and much more. However, older dogs respond very well to chiropractic care and regular check ups help them throughout their golden years! What issues do older dogs struggle with? 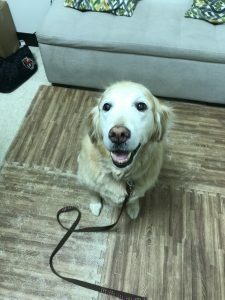 Many senior dogs make their way to us because their owner’s notice that they slip on slick floors, don’t use stairs any more, won’t go on walks or play, and much more. Some of this is part of natural aging. After all, we all slow down as we get older. However, there is also a component of natural wear and tear throughout life that contributes as well. For example, injuries that a pet sustains early in life can often manifest in a major way later on. Have you ever heard the expression, “as the twig bends so grows the tree”? Essentially, small issues early in life can compound and progress to big issues down the road. Arthritis is one of these issues. How does chiropractic care help older dogs with arthritis? Arthritis is the result of inflammation and abnormal stress on a joint. In response to this abnormal stress, the body will lay down bone to help stabilize the area. This is the bony growth that a doctor often points to on an x-ray as a sign of arthritis. So how does animal chiropractic care help slow and possibly prevent degeneration of joints? By correcting structural dysfunction of the spine. Structural dysfunction is what occurs when parts of the spine aren’t moving correctly. It leads to chronic inflammation and abnormal stress on joints. Additionally, when one area of the spine isn’t moving well, other areas have to move more to make up for the deficiency. This is known as compensation. The compensating areas of the spine are put under a lot of stress which can lead to arthritis and even vertebral disc injuries. It is similar in nature to a broken link in the chain – when one part is weak, the whole is weak. The key is to correct the broken links early, and animal chiropractors are trained to do just that. When it comes to structural dysfunction of the spine, a board certified animal chiropractor is your best bet. They will identify any issues early on and correct them using very gentle adjustments. In fact, there is typically no cracking or popping in animal chiropractic. Additionally, we can add rehabilitation exercises for your dog. Did you know physical therapy isn’t just for humans?? With exercises targeting weaknesses in your dogs muscular system we can stabilize the joints of the spine and limbs which helps with longer term quality of life. Dogs are a loved and integral part of our family, which is why watching them age can be difficult. They get weak in the back, deal with joint pain, lose muscle mass, and more. The good news is chiropractic care can help prevent and slow some of the issues as our furry ones deal with as they get older. However, it is much easier to address them early and follow up with periodic check ups then try correcting them when the issues are advanced!